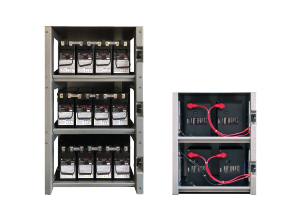 The innovative OutBack Integrated Battery Rack system is a comprehensive battery enclosure which includes all cell interconnects, cabling, and series string over current protection and disconnects. All electrical connections are made at the factory and ship fully assembled with the exception of the batteries, which can be quickly added and connected on the job site, making the Integrated Battery Rack uniquely easy to specify, order and install. Unlike typical steel racks or sheet-metal enclosures, the OutBack design is crafted of powder coated aluminum, resulting in a cleaner appearance able to withstand the most challenging environments– while weighing less than 90 pounds. The 2-shelf IBR-2 is sized to fit under an OutBack Radian inverter/charger to reduce system component “clutter” and make the best use of installation space. Clear covers on the racks permit visual inspection of internal components while providing additional.